The Sneaky Mommy: An Ode to the Pausley's & More Cake! On Thursday, we had a little good-bye dinner for Pastor and Linda Pausley. It had been three months since we'd seen them, and it was SO nice to be able to talk to them again. They will be leaving for Florida on Sunday night...for good this time. I felt like I was sitting with my most favorite aunt and uncle who I just have this childlike awestruck admiration for. I just wanted to soak in everything they said. Pastor and Linda have been the most amazing examples for Cody and I as we've started down the road of ministry (...marriage...parenting). Anytime we've needed anything, the Pausleys have always been a huge encouragement to us and always had wonderful wisdom to share. We've had a lot of funny moments with them, too. 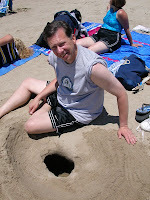 My favorite was when we went to Cal California, and Pastor and I both showed up at the beach in the same swim trunks. I had borrowed a pair of Cody's since Cloe was such a tiny baby and was still "swollen", as I like to call it! This picture is horribly embarrassing, but it sure adds good effect with the story! Even as we ate dinner (Pastor Trent and Lydia were with us too), it felt as if we all were kids who just kept asking questions and soaking up answers. When it was time to go, I wanted to shout, "I haven't learned everything I needed to from you--don't go!" We love Pastor and Linda, and I'm confident God is going to use them in great ways in Florida! So, Lydia and I are kind of back to the lone rangers. Our fearless leader, Linda, is gone. Thankfully, God is in control and continues to not give us more than we can handle (at times I feel like an overstretched balloon, though!). I've really been able to apply the verse that says, "When I am weak, YOU are strong." God also promises to work best through my weakest times. I'm there! Yes, God is truly giving strength! I'm so encouraged by the promise that we will be in eternity with Pastor and Linda, too. I'm asking that my "mansion" be right next to theirs. Then, in the morning, we'll enjoy Hazelnut coffee (Pastor's favorite) and fresh Dutch pastries (Linda's favorite). I'm pretty sure God will work that out--right!?!? SO, I really was just going to post on another cake...I'm in a rut of loving cake making! Cody loves raspberries, so I decided to make the Lemon Crumb Cake a Raspberry Crumb Cake. It sort of worked--the filling was really runny, but very yummy! I already know for next time, I'll just put a layer of fresh raspberries on the bottom cake and then add the cream filling (without mixing in raspberries). It should work much better. AND, Lydia said it tasted like "Restaurant Worthy" cake. I just love her! She knows the way to my heart. Well, I'm off! No kids this weekend! Time for a great all-day date with my man!